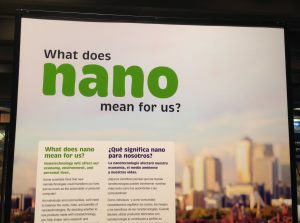 To teach children the benefits of nanotechnology in improving our lives, you need only head to a museum partner of the Nanoscale Informal Science Education Network. Can’t make it to the museum? This group also makes available lesson plans to “educate” school children on the unquestionable “benefits” of nanotech. Nanoparticles are very tiny particles (measured at the nanoscale) that behave differently than their regular size counterparts and can go places in nature and the human body that their counterparts cannot (crossing the blood brain barrier or entering bone marrow for example). While more research on the effects of nanoparticles on health and the environment are needed, we have enough evidence of harm (especially to workers handling these materials) to be concerned. 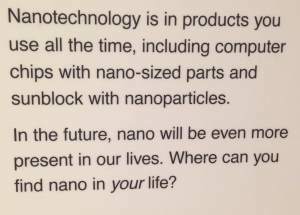 Yet the shiny exhibits at the museums and the lesson plans are designed to give children an appreciation for nanotech. They are not designed to create critical thinkers or to educate children about potential harms that have recently received the attention of the Environmental Protection Agency. This is unfortunately part of a larger trend. The factory workers sickened by handling nanoparticles and the grassroots activists raising important questions are not in a financial position to set the agenda on these issues. There is excellent work being done by a handful of NGOs and independent researchers, but because the public relations agenda promoting benefits at any costs is so strong and well-funded, the rest of us will have to work even harder to get the full story out. This dynamic is even more prominent in the global discussion about “feeding the world.” Read part 2 of this blog for more on how this is playing out at the World Expo in Milan this year.